I love a good debate, but Monday's was hard to enjoy, since Donald Trump couldn't let Hillary Clinton get a word in edgewise. In fact, Donald Trump interrupted Hillary Clinton during the debate so many times that it made me start thinking of all the things that happen less frequently. Why? Because he cut her off and spoke over her at least 51 times, according to Pew Research's Senior Demographer and Associate Director Conrad Hackett. 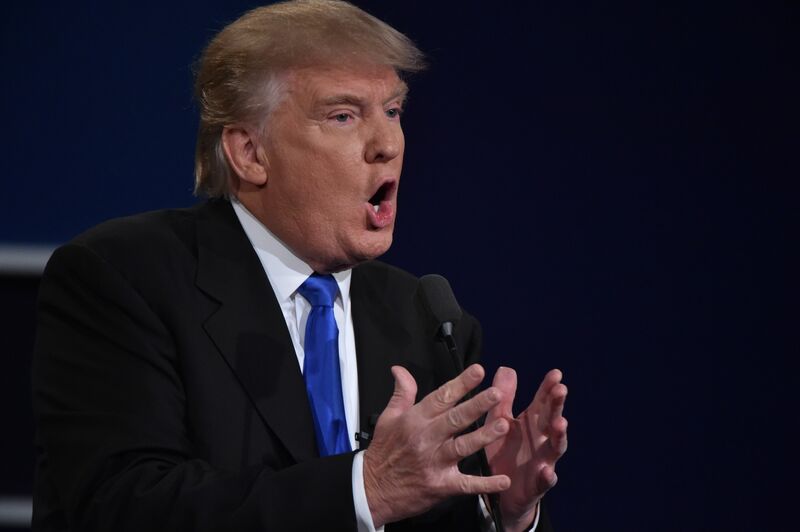 It's estimated that Trump spoke for 68 percent of the debate, while Clinton spoke for only 38 percent. This means that I had the dry heaves for roughly 68 percent of Monday night. Nothing makes me want to push someone off a mountain like being interrupted (note: Do not push someone off a mountain, even if you're being interrupted a lot), but Clinton remained calm and collected. Regardless as to who you endorse, it's hard to ignore the fact that Trump didn't really seem interested in actually debating anything; after all, it takes at least two people to debate. It felt more like Trump was performing a one-man show, where the only person who was amused... was himself. Just to give you a little perspective, here are 10 incredible things that literally happen less often than Trump interrupting Clinton. Some experts say that in terms of your health and personal hygiene, you really only need to shower once or twice a week. Personally, I feel like like a giant ball of dirt if I don't shower daily. Regardless of your own frequency, though, odds are you will still shower fewer times in a month than the number of times Trump interrupted Clinton during the debate. There's an entire science behind chewing food, and experts at Ohio State University say that you should chew meat up to 30 times before swallowing. This means that Trump interrupted Clinton 21 more times than it will take for you to properly masticate your steak. Unacceptable, especially if your steak if really, really tough. The average adult laughs about 15 times a day. Are you hearing me? It's more than three times as common for Trump to interrupt Clinton than it is for you to laugh. I'm disgusted. Yes, I'm serious. Linsey Lindberg, also known as Mama Lou, holds the world record for crushing 10 apples in her bicep in a minute. Still, she's no match for Trump's skills when it comes to interrupting Clinton. Science says that the average person blinks 15 to 20 times a minute, which means Trump is interrupting Clinton way more in one debate than you are blinking in a minute. The average woman owns about 19 pairs of shoes at any given moment. That's an impressive collection of shoes, but I'm sorry — Trump's interruptions are still more abundant. The average human pees around six times a day, meaning 42 times a week, meaning Trump interrupts Clinton more than you pee. Drink more liquids, please. Canada's Aaron Caissie set a record when he balanced 17 spoons on his face at one time. Sadly, Trump is better at interrupting Clinton than Caissie is at balancing spoons on his face. According to research conducted by eHarmony, the average woman will kiss 15 people before finding her Prince/Princess Charming. Trump will interrupt Clinton more times than you'll get lip action. The average person sneezes less than once a day, making for less than 31 sneezes a month, give or take a sneeze. Can you imagine being interrupted by Trump more than once a day? Me either.